The imperfect but generally stable peace process in Northern Ireland has trundled on since the signing of the Good Friday Agreement in 1998 and Islamic fundamentalism and right-wing extremism are now usually regarded as more serious threats to British security than Irish republicanism. It has thus been quite easy over the past few years to forget just how devastating the conflict we still euphemistically refer to as ‘the Troubles’ actually was. In strictly military terms, the war in Northern Ireland could accurately be regarded as a low-intensity conflict, yet between 1969 and the Provisional IRA ceasefire of 1994, over 3,500 people lost their lives as a direct result of violence in Northern Ireland or emanating from the region. The story of the Northern Irish conflict is one of cruelly unexpected death, widespread bereavement and lives blighted by fear, anger and bitterness. But it is also a story of a remarkably resilient people, whose desire for peace led them ultimately to reconsider their attachment to the past and embrace compromise and reconciliation. With the stability of the peace process now undermined by the result of the UK referendum on membership of the European Union, it is worth briefly reflecting on the role played by history in the dynamics of the conflict. Rigid, exclusive and often highly territorial understandings of the past directly fuelled the violence that erupted so catastrophically in 1969 and the polarisation and cultural entrenchment that would mark the next few decades. On the one hand, nationalists regarded themselves as heirs to an ancient Gaelic culture, whose ancestors had been systemically dispossessed, marginalised, exploited and murdered by colonists from the neighbouring island. For their part, many Ulster unionists were proud of a history of colonial settlement dating back to the early 17th century, in which industrious, god-fearing Scottish Presbyterians and English Anglicans carved out a niche of British civilisation in an otherwise wild and inhospitable corner of Ireland. Importantly, the memory of suffering and victimhood experienced over the centuries by the communities that clung to these narratives helped sustain them. The historical episode that has had by far the greatest influence on the perpetuation of divided identities in Northern Ireland is the First World War. Well over 200,000 Irishmen, from both political traditions and all walks of life, fought in the war and at least 35,000 of them died as a result of military service. While Unionist and Nationalist soldiers rarely fought together, they shared similar experiences of violence, loss and deprivation on the Western Front and elsewhere. Yet the Easter Rising of April 1916 and the social and cultural forces it unleashed would fundamentally transform the country to which many Irish veterans returned in 1919. Ultimately, the Rising, the subsequent War of Independence and the partition of the island would ensure that the ways in which the two communities engaged with the memory of the First World War were very different indeed. For Ulster Unionist men and women, the memory of the Great War in general and the Battle of the Somme in particular took on an almost sacred significance over the course of the 20th century. The blood sacrifice of the 36th (Ulster) Division was regarded as having purchased the right of the six counties to remain within the United Kingdom, while the rest of the island seceded. Commemoration of the war is thus not simply an element of Unionist culture, it is absolutely central to the way many Unionists understand themselves and their place in the world. Among the nationalist population, memory of the war has always been more complex and generally more muted. We should remember that major Armistice Day ceremonies were held in Dublin, Cork and Limerick and poppies were quite commonly worn in the Free State between the wars. There can be no doubt, however, that in independent Ireland there has always been greater emphasis on the rebels of Easter 1916 and the men who served in the IRA during the War of Independence than on the those who fought at Gallipoli and on the Western Front. By the 1980s, there was little room in the popular or official imagination for anyone who did anything other than fight against the British in 1916 or the years afterwards. The situation today could hardly be more different. The historical amnesia regarding the Irish experience of the First World War among the nationalist population has been almost completely reversed and people from disparate communities come together to commemorate it in a way that would have been unthinkable just ten years ago. An ironic but very positive situation has thus emerged, in which a shared memory of the most violent conflict in British and Irish history has been used to help people move beyond the violence and discord of the more recent past. This was very much the approach when the Island of Ireland Peace Park was opened by the Irish President Mary McAleese and Queen Elizabeth in West-Flanders in 1998 and during the British state visit to Ireland in 2011, when the Queen showed a remarkable willingness to engage with the troubled history of Anglo-Irish relations. 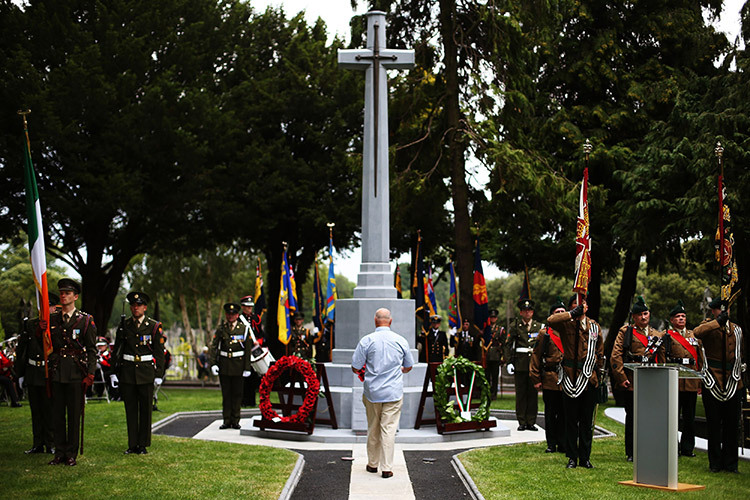 Most recently, the dedication in July 2014 of a Cross of Sacrifice in honour of the Irish and British dead of the Great War at Glasnevin Cemetery in Dublin marked a milestone in the history of Anglo-Irish relations. The event saw Irishmen serving in both the Irish Defence Forces and the British Army come together to pay tribute to the dead of the Great War in a cemetery that has long been associated with those who struggled to end British rule in Ireland. This process of using more inclusive historical narratives to move away from a conflict that was shaped by understandings of the past will not be jeopardised by the UK’s break with the European Union. Peace in Northern Ireland depends, above all, on the desire for peace, which certainly remains. The climate of uncertainty that now pervades these islands should nonetheless remind us that lives are potentially at stake and that the stability of the peace process should never be taken for granted. Edward Madigan is a Lecturer in Public History and First World War Studies at Royal Holloway, University of London.